Partisan politics is far from new in news reporting, but the proliferation of niche digital news publications aimed at readers -- and/or viewers -- across the political spectrum appears to be accelerating. While most of the attention has been on conservative and/or alt-right publications, liberal and progressive publishers are also gaining steam. "Overtly conservative news sites seem to have much greater brand awareness among the general public than liberal digital outlets,” notes Howard Polskin, president of The Righting, a publication tracking the growth of right-wing publications, but which is expanding its coverage of the left. “Some of this parallels the noisy rise of Trumpism, which champions nationalist and small-government narratives that are published by the conservative websites. Popular sites like Breitbart, Infowars and The Gateway Pundit court controversy, which draws widespread press attention and thus propels them into the consciousness of the average person,” Polskin explains about the relatively higher profile of right-wing digital news sites. But an advance look at The Righting’s first “Left-Right Report” shows that with the exception of FoxNews.com, which beats the next biggest rival (The Huffington Post) in monthly visitor traffic by a margin of more than two-to-one, the race is pretty close among the rest of the pack. 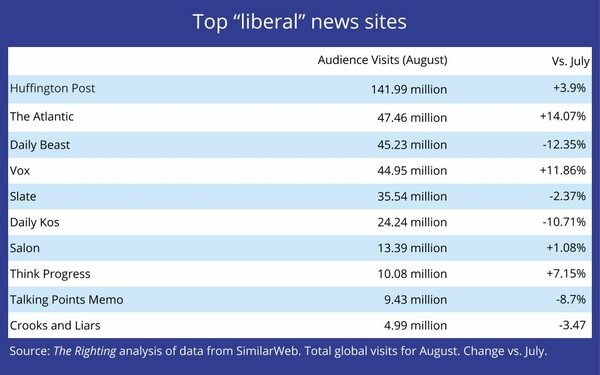 The chart above shows the top 10 left-leaning news sites and their most recent growth or decline. In addition, a number of newer digital pure-plays -- most aimed more at millennials -- have begun to spring up and are gaining traction -- mainly by distribution via social-media channels, including Now This News, The Young Turks and Robert Reich’s Common Dreams. 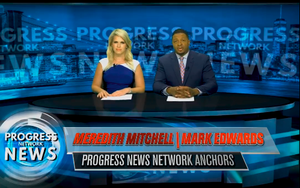 “We are the first one to be distributed purely on Facebook,” says Steven Rosenbaum, executive producer of the just-launched Progress News Network and a regular weekly columnist on MediaPost. PNN, which is backed by a group of progressive-minded, media-savvy investors, sees its niche as appealing to people who get most of their news from Facebook. Their goal is to influence the ones that don’t vote. “The real crisis in our country is that there are a 100 million Americans who don’t vote,” Rosenbaum explains, adding that PNN currently has no business model and it’s immediate focus is on impacting the midterm elections. He says it has no explicit “KPIs,” but will reassess its role after Election Day, based on what it thinks its impact has been.